The Australian Competition and Consumer Commission has released the second quarterly report on the Australian petroleum industry. The report examines prices to March 2015. Following large falls in international crude oil and refined petrol prices, retail petrol prices in the five largest cities (i.e. 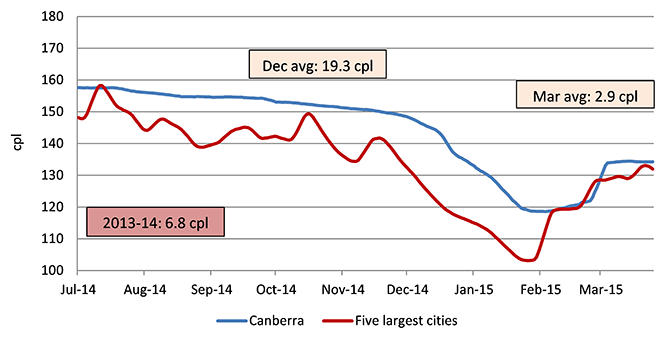 Sydney, Melbourne, Brisbane, Adelaide and Perth) fell to their lowest price in real terms in over fifteen years. Seven-day rolling average prices fell from a high of around 158 cents per litre (cpl) in July 2014 to a low of around 103 cpl in early February 2015. In real terms, this was the lowest price since June 1999. However, these historically low prices were short-lived. “Crude oil prices in February and March 2015 rebounded, influenced by increased political tensions in the Middle East and improved market sentiment due to a reduction in the number of active oil rigs in the US,” ACCC Chairman Rod Sims said. Brent crude oil prices increased by 19 per cent from the middle of January to the end of March, but there was an even larger increase in international refined petrol prices due to industrial action at a number of US refineries and shutdowns for maintenance in some Asian refineries. Singapore Mogas 95 Unleaded, the refined petrol benchmark that is used to set retail prices in Australia, increased by 35 per cent over the same period. Furthermore, the AUD–USD exchange rate decreased from around USD 0.82 to around USD 0.76 between January and March 2015. “The weaker Australian dollar meant that international refined petrol prices were around 4 cpl higher than they otherwise would have been, had the exchange rate remained steady,” Mr Sims said. The increase in retail prices has been lower in regional locations. 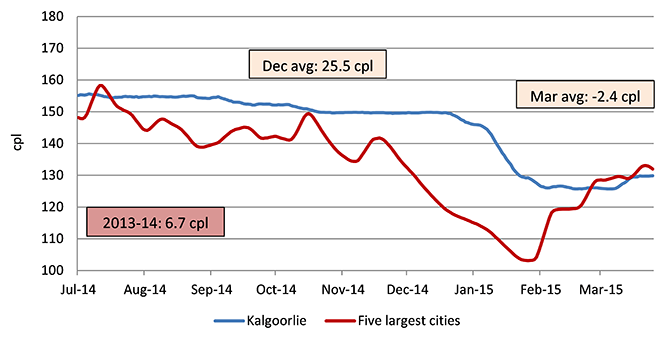 In its first quarterly report, the ACCC noted that in December 2014 the differential between regional retail petrol prices in aggregate and prices in the five largest cities had increased to 17.5 cpl. This differential remained at this level in January 2015, but narrowed in February and March 2015. 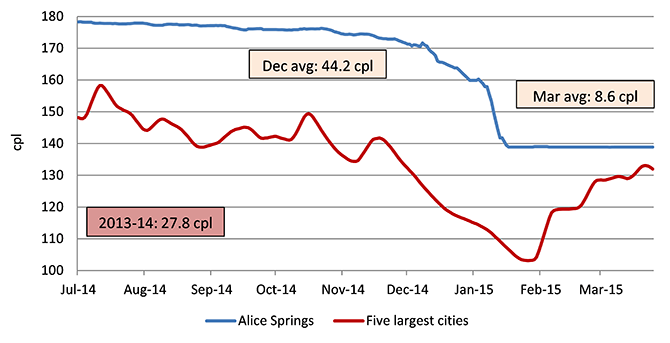 In March 2015 the city-country differential had decreased to 1.9 cpl. 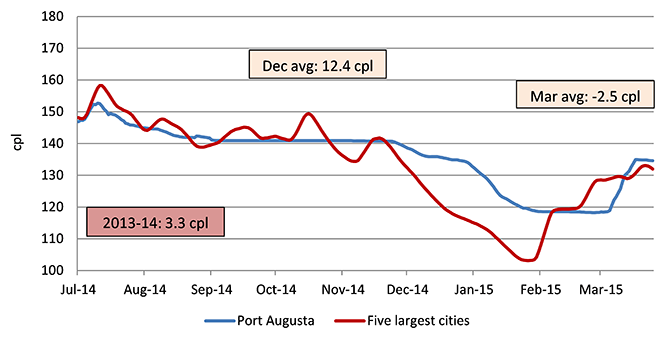 This was significantly lower than the differential in previous months and the average in 2013–14 (5.9 cpl). “Regional prices were slower to fall in line with international price movements, compared with prices in the larger cities. They were also slower to rise in the March quarter,” Mr Sims said. 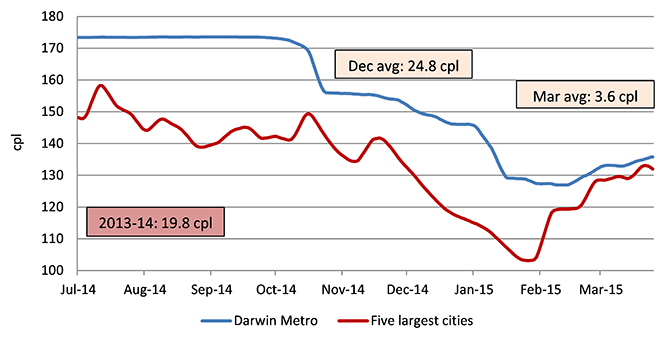 Between December 2014 and March 2015, monthly average retail petrol prices decreased in 94 per cent of the regional locations monitored by the ACCC. In March 2015, over 30 per cent of regional locations had prices lower than prices in the five largest cities. 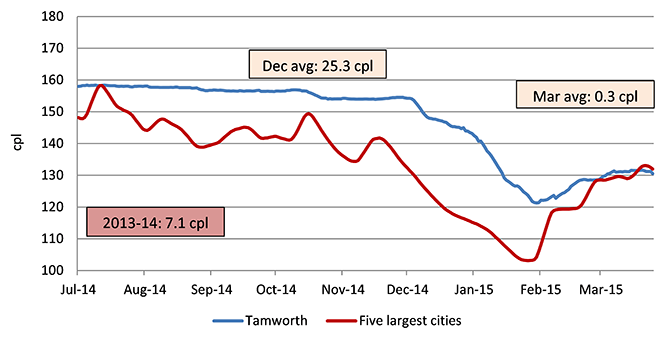 In a media release in January 2015, the ACCC provided charts for 13 regional locations across Australia where the price differential in December 2014 was significantly higher than the 2013–14 average. These charts have been updated to the end of March 2015. They show that the differential in all thirteen regional locations in March 2015 decreased substantially and was lower than the average differential in 2013–14. 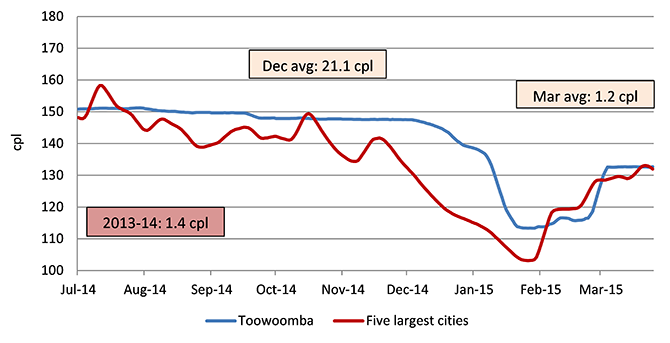 The charts below show seven-day rolling average retail petrol prices in particular regional locations compared with the five largest cities (i.e. Sydney, Melbourne, Brisbane, Adelaide and Perth) for the period 1 July 2014 to 31 March 2015. The ACCC uses seven-day rolling average prices to smooth out the influence of price cycles in the larger capital cities. 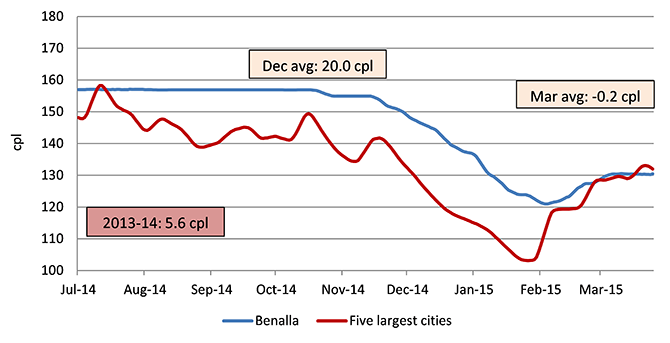 The charts also provide information on the monthly average difference between these two prices in December 2014 and March 2015, and the annual average difference in 2013–14. The source for all charts is ACCC calculations based on FUELtrac data.